Safari 3.1 also supports the newest and latest Web standards so that users can experience Web 2.0 contents delivery. In fact, Safari 3.1 is the first Internet browser to support HTML 5 <audio> and <video> tags, CSS 3 Web advanced standards such as CSS animations and CSS Web Font, as well as the offline data storage component. 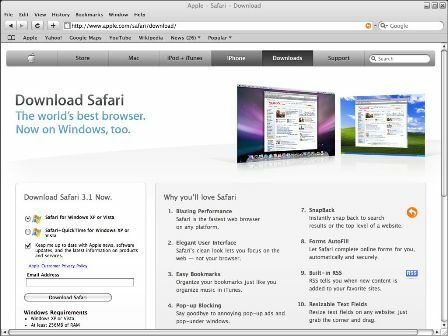 Safari 3.1 is available for free download for Mac OS X and Windows PC at official Apple site. For Windows system, Safari 3.1 only works on Windows XP or Windows Vista with at least 256MB of RAM running on 500Mhz Pentium-class processor or better. Two version of setup installer downloads are available, as listed below together with official direct download links to the setup files.